Popular anime torrent site NYAA has lost control over several of its domain names, which were deactivated a few hours ago. As a result, the site has become unreachable. The domain status suggests that the responsible registries intervened, but it could also be that the owner is responsible for the drastic action. NYAA is heralded as one of the top sources for anime content and has an audience of millions of regular users. The site has operated for years without any significant trouble. However, a few hours ago it suddenly became unreachable due to a worrying domain name issue. 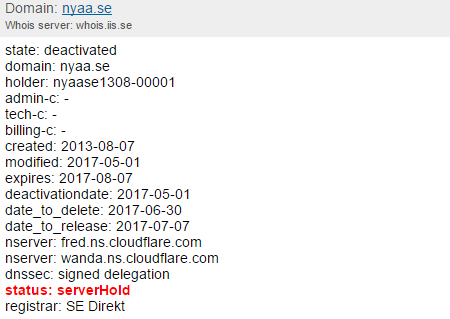 The NYAA.se domain was updated with the infamous “serverhold” status (see update below) which suggests that the responsible registry interfered. The status has been used in the past when domain names have been flagged due to copyright issues and stripped of their DNS entries. “This status code is set by your domain’s Registry Operator. Your domain is not activated in the DNS,” ICANN writes. As a result of the issue, NYAA is no longer accessible from its .SE domain. TorrentFreak reached out to the responsible registry for a comment, but at the time of writing we haven’t heard back. If the registry is indeed involved, then there must be some sort of legal authority backing the request. The .SE domain registry previously stated that it will not suspend any domain names unless there is a court order. “We believe that the judicial authorities should determine whether or not it is appropriate to take action against a particular domain name registrant. Unless we have been ordered to do so, there is a risk that we could call the validity of the legal process into question by taking action before a ruling is passed,” Punkt SE said. Thus far it’s unclear on what grounds the domain was deactivated. A copyright complaint is one of the possibilities, but this hasn’t been confirmed. The same is true for a manual removal by the owner (see update). Whatever the reason for the deactivation, there’s still hope for the site’s users. In theory, the NYAA team could return online if they setup an alternative domain. That is, if the domain name deactivation is the only issue they are facing at the moment, which remains to be seen. If more information becomes available on NYAA’s domain name troubles we will update this article accordingly. Update: The NYAAtorrents.org and NYAA.eu domains are also deactivated now. Update: There are several people suggesting that the domain names were taken down by the owner. The org domain also has a “pendingDelete,” which could back this up. When a domain is deleted before the expiry date it could trigger a “serverhold” status, which is generally set by the registry. There are also some screenshots in circulation that would back this up. However, TorrentFreak hasn’t been able to verify these. We can only speculate, but given that the domains were registered through different companies, manual removal by the owner would be a plausible explanation at this point. The article was updated to reflect this option. 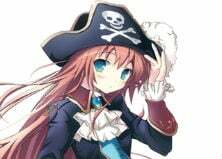 Update: TorrentFreak heard from several people, including site moderators and other people close to the site, that NYAA’s owner decided to close the site voluntarity. In other words, this likely means the end.